With all the right moving services, Meathead Movers is dedicated to get you safely into your new home. Our clean-cut student-athlete Turlock movers will fulfill all your moving needs efficiently. Turlock is an exciting city full of unbridled potential. Since it was founded in 1871, the city has been growing nonstop. This means there is never a bad time to move to here, as long as you find the right Turlock movers to make the transition as smooth as possible. Located in the heart of the Central Valley, Turlock has a population of almost 70,000. The city has always attracted merchants, and with significant agricultural roots, has seen a rapid increase in residential and commercial growth. Its convenient location along State Route 99, also draws travelers and commuters to the area. Turlock also attracts a strong student population with California State University Stanislaus campus located inside the city. If you are considering a move, Meathead Movers is here to help. Our moving company specializes in local, long-distance, and commercial moves to, from, and within California. We also provide reliable packing, storage, on-site relocations, and our distinctive moving concierge service. All our student-athlete Turlock movers are thoroughly screened and trained before their first move. Every one of our employees is committed to working hard on the job. To prove this, each employee will speed up the moving process by jogging when they are not carrying any boxes. That’s the Meathead Difference. The Meathead Difference is so powerful that we are the only moving company in California to offer a 100% Satisfaction Guarantee. If you are moving, there is no need to look further than Meathead Movers. 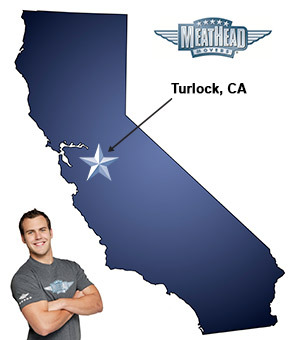 Call our Turlock movers today for a free no-obligation moving quote, and let us show you the Meathead Difference. Moving to Turlock? Here are some helpful resources. 115 S Golden State Blvd. The two student athletes i had were AMAZING. I forgot their names but they worked so hard. They were gentle with my items, but completed my entire move in only two hours! I will DEFINITELY use Meathead movers again for my next move! The boys worked quickly and efficiently. They were incredibly well mannered and always asked the right questions. They organized everything appropriately in my storage unit. Quick and very professional young workers. The young men that showed up to move us were extremely polite and worked hard to get as much as they could packed into our pod! We were very grateful to not have to lift the heavy stuff. It made our move run smoothly!